The Brookline Coolidge Corner Library at 31 Pleasant Street is the final home of the Brookline Town-wide Mosaic Installation. The 24 color accented panels were made with ceramic shards donated from Brookline homes and with the participation of numerous town residents. This project started as a temporary installation at the Brookline Town Hall with the 24 panels attached to 8 column faces creating a unified entry. The purpose was to have the well-being of each person entering Town Hall increased by a welcoming, engaging, and energizing building adornment. This truly was a community building project creating civic pride for the town hall and produced by diverse members of the town. Following this original installation, in 2008 a rotating five-site exhibition was funded by the Brookline Commission for the Arts and the Massachusetts Cultural Council. The purpose of the rotating exhibition of the Brookline Town-wide Mosaic Columns was to stimulate interest in permanent public art and to demonstrate how the community members have impacted our environment one shard at a time. The exhibition sites included the Temporary Town Hall at the Old Lincoln School, the Brookline Senior Center, the Runkle School, Coldwell Banker Residential Brokerage office, and finally the Coolidge Corner Branch of the Brookline Public Library. 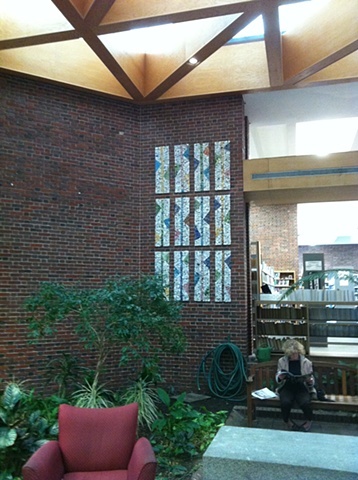 In 2011, these panels were donated by the artist to the Town of Brookline and installed at the Coolidge Corner Library. The installation was made possible by the Friends of the Brookline Public Library. 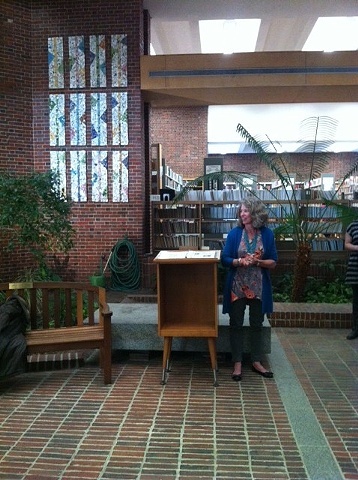 Special thanks goes to Cathy Dooley, Coolidge Corner Librarian.